My husband surprised me at work today with a beautiful box of chocolates from the chocolatier. I am pretty sure he was smitten by this chicken dinner!!! Try it at home and see if it wins you some chocolates!!!! It is THAT good!!! 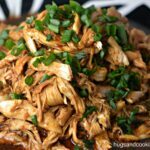 CROCKPOT HONEY GARLIC PULLED CHICKEN!!! Place all the chicken in the crockpot. In a bowl, whisk honey, tamari, blackberry jam, bbq sauce, olive oil, garlic & onion. Pour the sauce over the chicken. 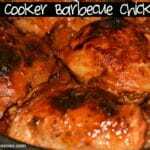 Cover the crock pot and cook the chicken on LOW for 4 hours and on HIGH for the last hour for a total of 5 hours. Carefully remove all of the chicken to a plate. 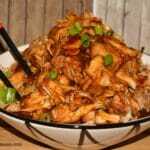 Remove skin/bones and using 2 forks, shred the chicken. Put the chicken in a bowl. Remove liquid from crockpot and put into a pot over medium heat. Whisk in the cornstarch/water and boil a few minutes to reduce. Strain this through a sieve. Pour the sauce over the chicken, stirring to evenly mix. Pour as much or as little as you’d like!!! Top with scallions!! Serve over rice! Add some chopsticks for fun! All I can say is…. Boy am I glad you got a Crock Pot! Nummmmy! I cannot wait to try this Recipe! Hope I get Chocolates too!! Thanks for posting! sounds delish!!!! Which chicken are you trying? I tried this last night. It was really good. I actually sped it up a little bit and pre cooked (boiled) the thighs for abt 30 minutes in water and I boiled the chicken breasts until they were cooked. I shredded the breasts and threw the chicken in with the thighs and it turned out great! I look forward to trying more of your recipes. Thank you! Instead of boiling meat how about baking or roasting in the oven? Boiling it is just so unappetizing! Oh and the dish I made was the honey garlic chicken! YUM YUM YUM! Has anyone tried this with boneless chicken breasts and thighs? I have never tried with boneless so I am not sure. 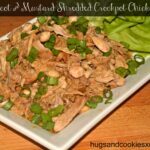 I made this with boneless chicken breasts and loved it!